I am writing to wish you a very happy New Year, keeping in mind all that happened during the year that just ended and looking forward to the year that is just beginning. As to whether you wish the next year would be as good or as bad as the year that ended, I suppose it depends on who you are. For most of us last year began with a lot of expectations. A change of guard had only just occurred and whatever difficulties the new chaps had at the beginning were thought of as teething problems of a new regime. We expected the new brooms to make a clean sweep without fear or favour. That was always going to be difficult because so many of the leading Blue people of the previous regime were also part and parcel of the new outfit. Why, Maithri even invited people who lost at the elections to his team because he wanted his people in Parliament, instead of Mahinda maama’s men. Of course, Maithri, the Blues who supported him together with the Greens came to power promising great things. They said that not only will they put an end to corruption and abuse of power, they will also bring to justice those who had been corrupt. Nepotism will be a thing of the past, they said. Looking back over the last two years, we saw dozens of people being brought before the police and the courts and paraded before television cameras but we are still eagerly awaiting the first casualty in the battle against corruption. It seems as if the wheels of justice are turning quite slowly for them. Well, actually, that is not quite correct because we have already had the first casualty in the battle against corruption – and it was none other than the lady probing bribery and corruption. That was because she had failed to mention to Maithri that she was questioning the top brass in the military! We shouldn’t be heaping all the blame on Maithri either. Why, there was the Green Man stubbornly refusing to believe that there was nothing wrong in the sale of bonds by the son-in-law of the boss of the big bank. Finally, it was Maithri who prevailed on him not to re-appoint the boss for another term. Looking back at the year that was, most of us are also confused about what is happening with the Chinese. 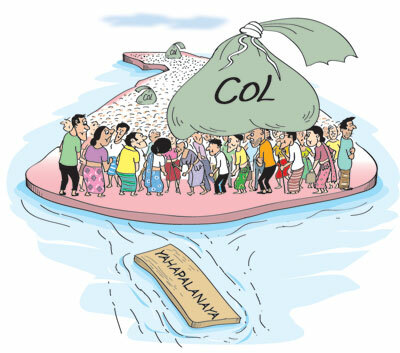 We were promised that the Hambantota port will not be sold to them and that the Port City in Colombo will not go ahead but I guess promises are made with the idea of breaking them. Meanwhile, the prices of everything keeps sky rocketing. The only other items that are able to keep pace with the escalating cost of living are the allowances, permits and privileges accorded to our elected representatives, so sometimes you tend to wonder, are they fooling all of us all the time? There are also other things that haven’t changed over the past year. Doctors still strike for the slightest reason, traffic accidents kill people senselessly and university students spend most of their time on the roads protesting – which is probably why we have a minister of higher education and highways now! As for those opposing the government, we must first ask ourselves whether we have an opposition. Any kind of resistance comes only from the Blues who rally around Mahinda maama, but they are only a few dozen at best and Mahinda maama himself has not taken the plunge to join that new party. Unfortunately for him, he too is surrounded by the ‘usual culprits’ such as Wimal, Udaya and Vasu who would have been ‘also rans’ in any election if not for the fact that they are clinging on to Mahinda maama’s saatakaya. He will better off without them but he doesn’t seem to realise that! Then there are the rathu sahodarayas who have indeed put up a decent performance. They say all the right things but sadly, they are not able to convert what they say into votes when it comes to elections. Who knows, when the next election comes along, they may be the only reasonable option left! We seem to have all but forgotten the North and East as well because no one talks about that region anymore unless some foreign dignitary makes a visit there. We had been promised a Constitution that will sort out the issues that led to the war, but no one seems to have a sense of urgency about that too. So, dear citizens of paradise, I don’t think most of us are looking forward to more of the same in 2017. Of course, those who govern us must be wishing for just that – and who can blame them because, as they say, every country gets the government it deserves! PS: One difference between the year that ended and the year that just dawned is that we may have elections this year after being free of elections of any kind for over a year. So, if you think you have a message to those who govern us, you should be making use of that opportunity this year!